Ever since we started tuning in to American Idol with the girls, I have caught myself saying something I don’t think I’ve ever said before: TGIF. Sometimes in the elevator out loud to a coworker, sometimes in my own head as I’m pulling into my driveway dreaming up quick dinner options. Cause even though the show is on Wednesdays and Thursdays, we invariably have a conflict on at least one of those nights and by the time we’ve queued up J.Lo and friends on the DVR, it’s Friday, when the rest of the world already knows Naima has been booted, Pia (the girls’ favorite) has finally tried something up-tempo, and sparks are flying between Haley and Casey. (Has this been confirmed? Do we know yet?) Other than the fact that we often miss the chance to text in our vote, our Idol delinquency doesn’t seem to detract from the drama in the slightest. (Especially for Abby and Phoebe who still don’t understand why you can’t fast forward live TV.) And so as soon as we walk in the door, the girls are telling us to hurry up mom, hurry up dad, American Idol’s on! Which means we need to do some serious short-order cooking. Fifteen minutes later we’re sitting down on the couch with a breakfast burrito and a glass of chardonnay, flanked by two wide-eyed kids who are in it to win it. Thank God It’s Idol! Warm four large whole wheat tortillas in a 300°F oven. 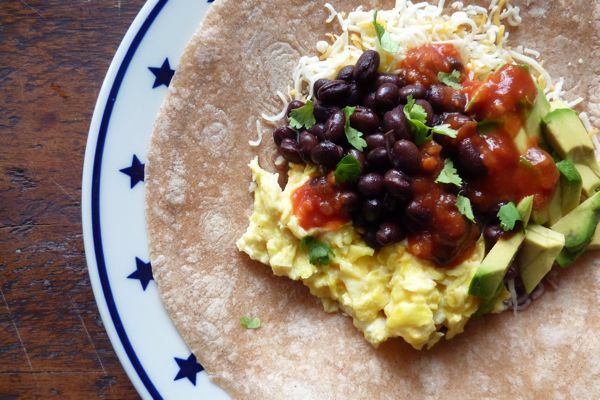 As they warm, prepare your favorite fillings: scrambled eggs (I like adding a few dots of cream cheese to make them fluffy), black beans, avocado chunks (or guacamole), shredded jack or cheddar, salsa, sour cream, cilantro. Customize each burrito to each diner, wrap up and serve with lots of napkins. I can so relate to this. I have two young, wide-eyed girls who are in it to win it too. Sadly enough, it’s pretty much the highlight of our crazy week. If you didn’t watch last night, I won’t spoil it for you . . . Please don’t! I just overheard my coworker saying she sobbed. Then I ran down the hall so I wouldn’t hear any more. Another quick and tasty idea: Breakfast quesadilla. Same ingredients as your burrito, but pressed between two tortillas. We love brinner for dinner! Now that we seem to perpetually have avocados and black beans in the fridge — as they are staples of my baby’s frenzied gnoshing — I’ve been making sort of a bastardized huevos rancheros out of those same ingredients with a rather alarming frequency — such a perfect and easy to throw together meal! We’ll have this tomorrow when we watch live. Always looking for a way to use up our hen’s eggs. I think the fam. will enjoy this. Anything with black beans and avocado I’m in – thanks for the great idea!